A front strut bar mounts between opposing front strut towers and reduces the flex that these towers experience during hard cornering. Reducing the flex will keep the wheels in position which allows the tires to gain maximum traction on the road. This will help improve traction when turning and increase turn-in response. 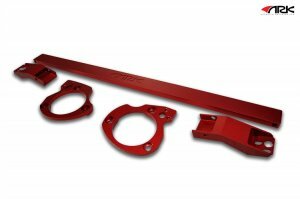 ARK Performance strut bar braces are made from high quality, lightweight, and rigid 6061 aluminum.